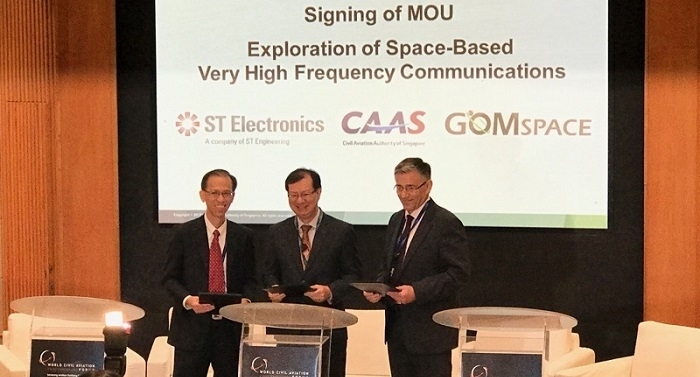 GomSpace has signed a MoU with the Civil Aviation Authority of Singapore (CAAS) and Singapore Technologies Electronics Limited (ST Electronics) to explore the application and deployment of space-based Very High Frequency (VHF) communications for air traffic management (ATM) in and around the Singapore Flight Information Region (FIR). The MOU was signed between Mr. Kevin Shum (Director-General of CAAS), Mr. Tang Kum Chuen (President of Satellite Systems Business, ST Electronics) and Mr. Niels Buus (CEO of GomSpace) on the third day of the World Civil Aviation Chief Executives Programme (WCACEF) held at the Singapore Aviation Academy. 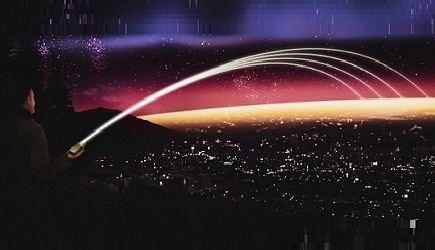 Space-based VHF communications represents the next level of communications capability, and will complement Singapore's existing ground-based equipment. It is a concept where VHF communications equipment will be mounted onto a constellation of low-earth-orbit satellites to enable clear, cost-effective and real-time communications between air traffic controllers and pilots anywhere. The technology will improve safety and allow for communication with aircrafts where ground-based VHF communications are currently not available, increasing ATM capacity and reducing delays for aircraft in turn. CAAS is committed to continually investing in cutting edge and innovative solutions to ensure that it can safely support the growing air traffic in the region. With this collaboration, Singapore will be the first country in the world to move towards space-based VHF communications. This technology will enable CAAS to improve traffic throughput in the Singapore FIR, while enhancing safety and efficiency of ATM. The activities under this MOU is a natural continuation of GomSpace’s pioneering work in space-based ATM as it first demonstrated in 2013 and will bring about significant new opportunities for Air Navigation Service Providers and airlines to increase safety and ATM capacity while reducing operations costs.